A quick article today chaps, featuring a few short pointers on key wardrobe favourites for every guy in the office. I work in an office, Monday through Friday, 0900-1700. I always want to look my best but want that edge of difference to make me stand out. Fundamentally, with all my posts, I can’t afford the expensive new suits and accessories of your everyday typical ‘baller’, so instead I choose to re-wear, mix up and match different outfits with those of others that I think will work. Here is today’s outfit for the office, not overly expensive, but I received several compliments already…and it’s only lunchtime! The Topman grey skinny tailored Blazer gives the smart look, with added black cotton trim to really smarten up this outfit. With its fitted approach under the arms and around the shoulders, it formalizes what would’ve been a white shirt and black jean combo. The Black edging and fine lapel offer the tailored look opportunity for a tie. As I’ve gone for black, white and grey, it really didn’t limit me to tie style, colour or material – I’ve therefore gone for a bold red silk tie to bring the outfit to life. This tie was £2.00 from Primark. Whilst we’re on accessories, I’ve worn my red smart socks courtesy of The London Sock Co. to tie the outfit together. They really set off the tan brogues from Burton Menswear (these I got free when i purchased a three piece suit for £99.00). 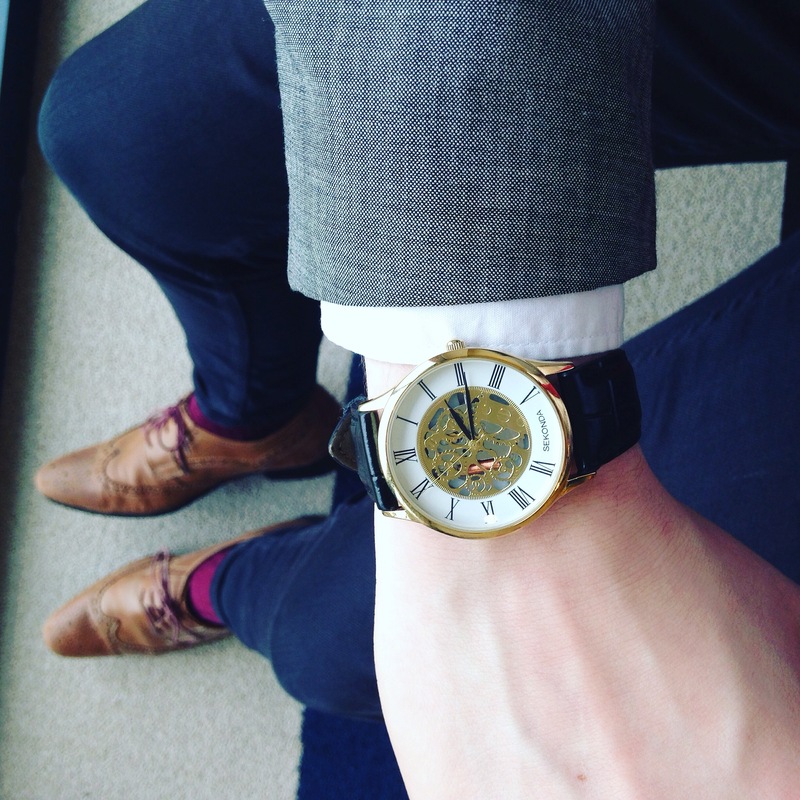 To top off the outfit I’ve worn my Links of London black rope bracelet and Gold & Black Cog-exposed Watch from Sekonda. Not only would this outfit suit the office, it would be perfect for a smasual party, a night in a fancy club or when you’re passing round the over sized Grey Goose bottle for a selfie to impress. (I joke).